Descendant research is the practice of selecting one or more distant relatives, and researching their descendants, instead of their ancestors. In ancestor research, the focus sometimes shifts to finding more and more generations. In descendant research, the focus is always on “how wide” instead of “how tall.” Descendant research is a lot like harvesting an apple orchard. It is easiest to reach the low hanging fruit. The current version of Ancestral Quest (14.00.19, Both Free & Full versions) includes the ability to do descendant research using the FamilySearch Family Tree. 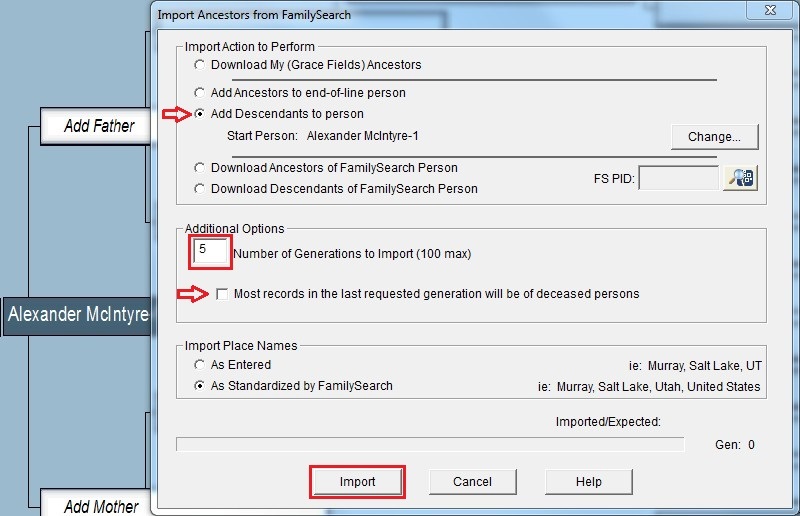 It is tucked away in the Menu Bar under FamilySearch | Import Family Lines. Be aware that there is a lot of information in the Family Tree which was researched poorly. Before doing large imports from this source, I recommend that you create a temporary file to hold the information, so that you can evaluate it before actually placing it in a good file. To learn how to build this file, and systematically “harvest” your Family Tree, link to the next article on Descendant Research. For this demonstration I have selected my 3rd great grandfather, and created a file with his as the only record. If you have not already logged on to FamilySearch, you will be required to so so now. Click on Import Family Lines to begin. 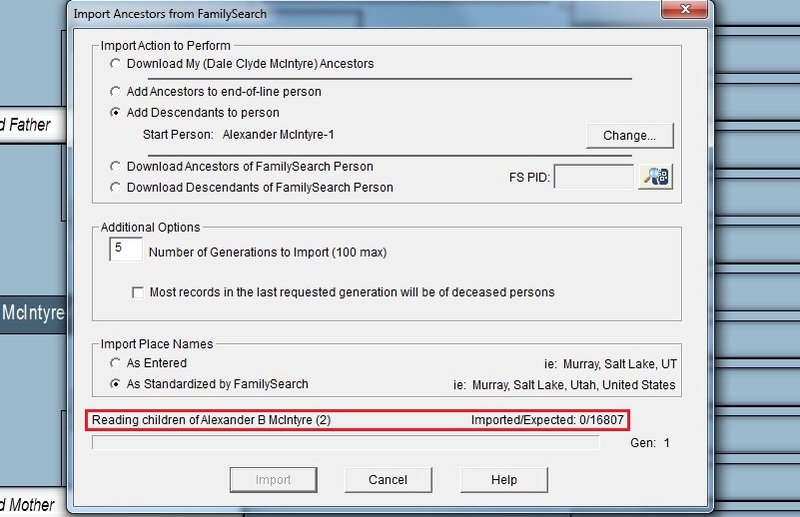 This is the Import Ancestors from FamilySearch screen. It was named before descendant research was possible in Ancestral Quest. The first thing you will need to do on this screen is to click the Add Descendants to Person radio button. Since I started with my 3rd great grandfather, and his generation will not be included in the count of generations, I will come back down the descendant lines for 5 generations. This will reach down to my generation. Since all of my siblings are living, I can reasonably guess that most of the people in this final generation will also be living, so I un-click the check box to indicate this. Now I click the Import button. Ancestral Quest tells you what it is about to do. If you agree, click the Yes button. Since some people will import into a good file, Ancestral Quest gives them one last chance to preserve the integrity of their file. We are using a temporary file, so we will not do the backup. Ancestral Quest begins downloading records. If the account used to access the Family Tree was a non-member account, AQ will report how many individuals were downloaded, and the process will be completed. If the account used was a member account, Ancestral Quest will access the temple records for the downloaded individuals. AQ will give a count of how many records were downloaded, and the process will be completed.